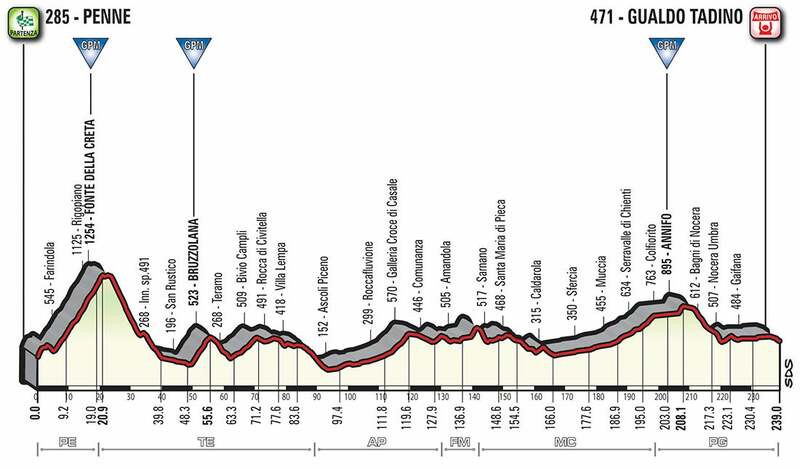 Stage 10 is the longest of the 2018 Giro at 239 kilometers. From Penne the course runs across the central Appenines, skirting east of the Gran Sasso and the Sibillini Mountains up to Umbria’s Appenine. Repeated short climbs, including three that are categorized, lead to a hilly finish fit for the puncheurs. Nevertheless, a sprint cannot be ruled out. 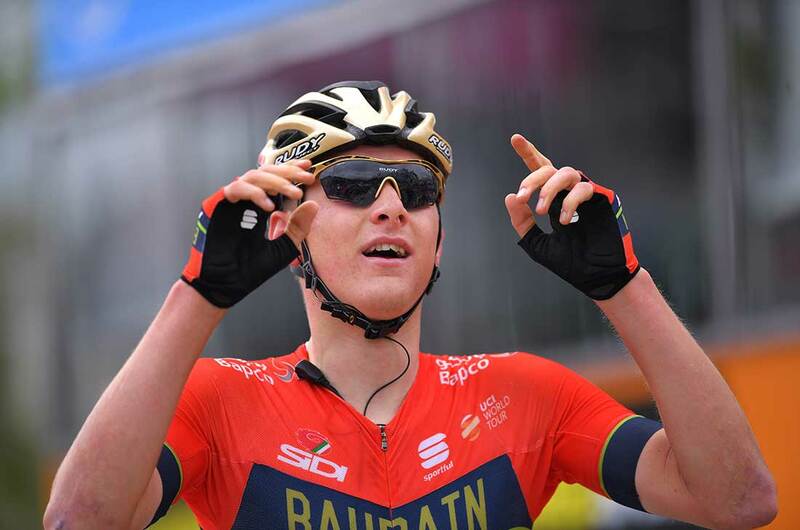 At the end of a marathon 244km stage, Matej Mohoric (Bahrain-Merida) bested his breakaway companion Nico Denz (Ag2r La Mondiale) in an elbow-to-elbow sprint Tuesday in Giro d’Italia stage 10. “We have Pozzovivo riding well in the GC, and we are all working for him, but he gave me a free card to play for the stage win,” said Mohoric. 2. Nico Denz (Ag2r La Mondiale), s.t. Behind the escapees, stage 7 winner Sam Bennett (Bora-Hansgrohe) sprinted to second out of the bunch. Simon Yates finished with the peloton, maintaining his grasp on the pink jersey, but his Mitchelton-Scott team did suffer a setback in the run to Gualdo Tadino. Esteban Chaves, who started the day second-place overall, lost touch with the group early in the race and fell out of contention. The race leader went on to say that stage 10 was a particularly fast and aggressive race. “It was the most aggressive stage I’ve seen for a while,” added Yates. “This usually happens in short stages only. Stage 10’s final 20 kilometers featured sinuous, rain-soaked roads that descended into the finish. Denz and Mohoric had an additional collaborator in Davide Villella. However, the Astana rider wasn’t comfortable with the slippery descent. Though he kept the duo in sight, he was dropped for good with about 10km to go. Behind, Sergio Henao (Sky) and Alessandro de Marchi (BMC) tried unsuccessfully to bridge the gap. A few other notable GC riders had trouble on the descent off of the final of three categorized climbs. Best young rider Richard Carapaz had two mechanicals. After some quick assistance from his Movistar team, he was back in the mix and finished with the peloton. Defending champion Tom Dumoulin (Sunweb) also had a hiccup on the descent. He pulled off to the right side of the road after a minor crash. He too was able to chase back to the group. Into the finale, Mohoric did not feel confident in his sprint. So, he tried attacking Denz several times in the last 10 kilometers. “I was not super-confident, that’s why I tried to attack him before in the last 10km a couple times,” said Mohoric. However, the two came into the finish together for a tough sprint after more than six hours of racing. Mohoric led out the sprint on the left side. It appeared that Denz was coming past with a final burst of speed, but the German stalled out and Mohoric won handily. The racing continues Wednesday with a similarly hilly profile from Assisi to Osimo, although stage 11 will be much shorter at 156km.